If you’re doing parties as part of your direct sales business plan, you’ve no doubt experienced a “drought” in bookings at some time in your career. I want you to imagine for a moment what it would be like if bookings came naturally for you, meaning that people were eager to book parties, their parties were holding on the original dates and were demographically close and convenient for you to get to, you had good turnouts for your home parties, you were making great income, and you were sponsoring, on average, one to two people per home party. Would you do more parties (or maybe even consider doing parties if you aren’t now) if that were the case? Of course you would! Creative bookings (which are a heck of a lot more work). So your goal at your home parties has to be to continuously duplicate your parties from your parties (or get bookings!). Here's the core “truth” about home parties – Its got to be about the experience for your guests, not your products. It’s the experience your guests are having at your current party that will compel them to want to book a party of their own. Your job is to connect with them and provide that fun, relaxing experience. I always say, if someone isn't having a great experience at your party, there's no way they're going to want to repeat that (not so great) experience with their friends. Here are a few ideas for creating an experience that will bring more bookings at your home parties. The more you can connect with your guests during the first fifteen to twenty minutes of your party, the more parties you’ll book, sponsoring leads you’ll get, and sales you’ll have at the end of your party. Make a list of what makes your party experience different and then look for places where you can change what your doing so your results change as well. Finally, there's a very simple change you can make right now that has the potential to make all the difference. Change your thinking about your results. Here's what I mean by that. If you don't have bookings now and you haven't been having success getting bookings lately, you're probably very focused on your lack of bookings. You talk about it, think about it, and are frustrated by it. The problem with that is, by focusing on what you don't have, you're attracting more of that! Energy flows where attention goes, and if you're showing up at a party feeling frustrated and like no one wants to book a party with you, your energy won't be the least bit inviting and no one will book a party with you! So change where you're putting your attention. 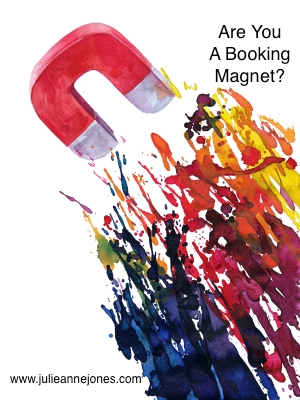 Start telling yourself (even if it feels like a lie at first) "I AM A BOOKING MAGNET!" "Everyone loves to book parties with me!" "I have more bookings than I know what to do with!" Tell yourself this when you wake up and before you go to sleep. Make a sign that says it and put it up in your office. Say it before you walk into your next party or pick up the phone to book parties. And then watch what happens. If you're changing your mindset in conjunction with using some of the powerful booking tools I've shared in this and other posts, you'll be amazed at how quickly the universe will rush to make your new mindset a reality! Thanks, Alissa. So glad you liked it and thanks for sharing! I love it Julie Anne! People want to feel noticed, important and valued. When you make the party about them and THEIR experience, everything else falls into place! So often, we get bogged down by our own worries (thinking about ourselves) that we inadvertantly forget the amazing, interesting people that we are blessed to share our space with! It's a BLESSING to be invited into another's home! 🙂 Great blog! Sharing this with my team!